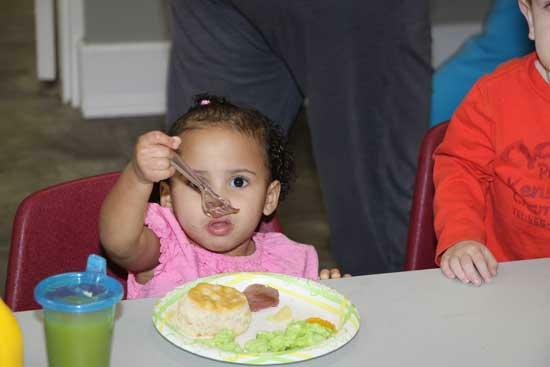 Elodie Meador enjoys a bite of ham during the Green Eggs and Ham lunch at Woodbury Day School Thursday. Students at Woodbury Day School enjoyed a Green Eggs and Ham lunch Thursday in honor of St. Patrick's Day and Dr. Seuss. Green Eggs and Ham is a best-selling and critically acclaimed book by Dr. Seuss, first published in 1960. As of 2001, according to Publishers Weekly, it was the fourth-bestselling English-language children's book (novel) of all time. Students participated in the preparation of the green scrambled eggs, using food coloring. Woodbury Day School is accepting applications for fall registration. WDS is a Tuesday-Thursday school located at the Woodbury Church of Christ. Hours are 8:30 until 2 on Tuesdays and Thursdays for children ages 2 to 5. Applications can be picked up at the WDS office on Tuesdays and Thursdays from 8:30-2:00, in the Woodbury Church of Christ office, or online at woodburychurchofchrist.org. You may call the WDS office at 563-5119 with any questions or email woodburydayschool@gmail.com. Students look forward to a delicious meal of green eggs, ham and biscuits.